If you like spicy, intensely flavoured food, then homemade kimchi is for you and there�s no better way to learn this well �guarded secret recipe than from an expert! This unique tasting dish can be very addictive and its also famous for its many health benefits. Ingredients is between $15 and $20 on the day depending on seasonal vegetable prices. Kimchi is traditional Korean side dish which is becoming more and more popular as its health-giving properties come to be better understood. Kimchi also had been chosen one of the super food in top five famous health magazine in USA as it contains a high proportion of fiber (from the vegetables), capsaicin which is said to burn fat (from the chili), generous amounts of calcium (from the salted seafood), appropriate quantities of high-grade protein (from fish and seafood these can be optional for vegetarian), and an abundance of vitamins (from the vegetables),iron and beneficial lactic acid bacteria and heaps of natural probiotics(through fermentation) moreover it is excellent for antioxidant activity. Come and enjoy making kimchi, and kimchi pancake!! It�s simple and it�s easy and what better time than now to make your meals healthier and more nutritious. 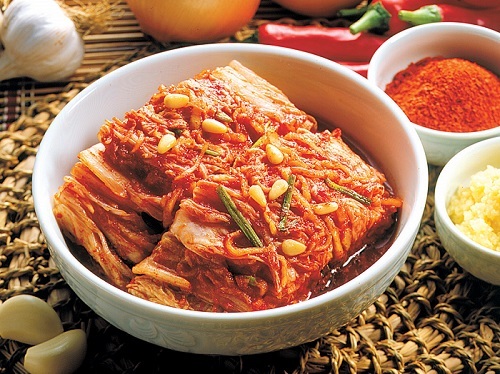 Kimchi will be perfect with any meal such as rice, meat, noodle or its own like a salad and many more� don�t miss out!